When I arrived at Myitkyina airport, I hadn’t realised that there would be domestic immigration. When the immigration officer asked me where I was staying in Myitkyina, I told him I was staying with a relative, but when he asked me for the address I didn’t know it. A few years ago this might have been a problem, but the officer was perfectly helpful, and pointed me over to arrivals (which I wouldn’t have been able to distinguish on my own, it being just a gate in a fence) where I’m sure he could see me meet Sr Mary. She assured me that immigration would know where I was, even without registering me, which we did. 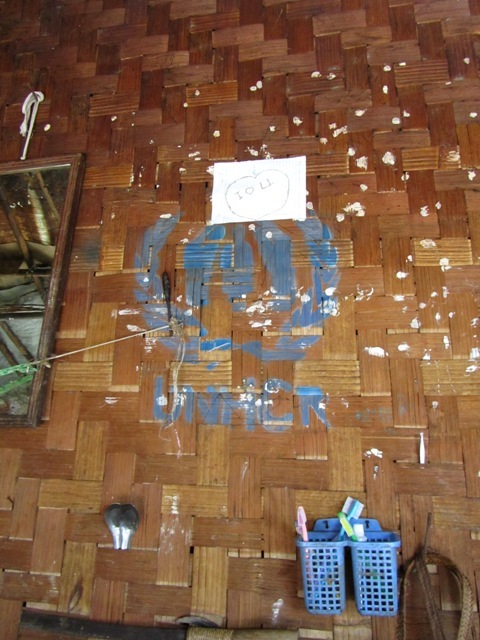 Conflict has been ongoing in the state since the end of a 17-year ceasefire in 2011 between the Burmese army and the Kachin Independence Army (KIA), the armed force of the Kachin Independence Organisation (KIO). The KIO formed in 1961 in protest of the lack of autonomy that the Kachin had been promised by Aung San’s government in 1947. 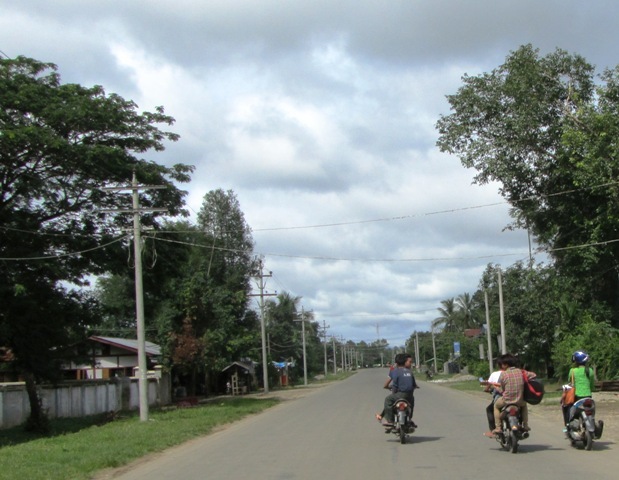 Until the ceasefire in 1994, the KIO governed most of the Kachin State, with the Burmese army having a presence only in Myitkyina and other towns along the railway lines. 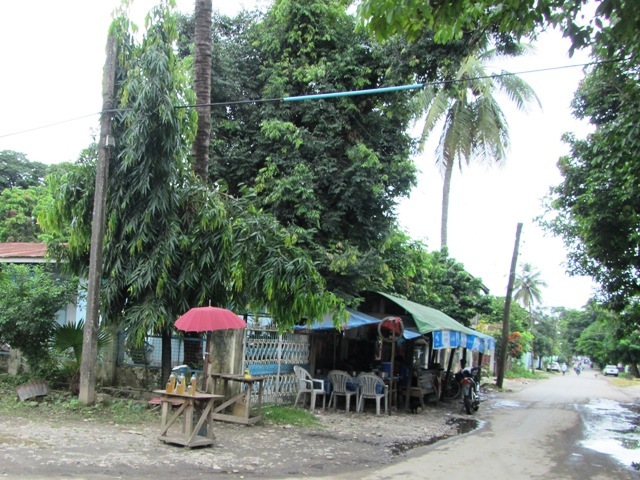 In Myitkyina, I saw large areas of the town behind barbed wire – army property. It’s no wonder that this conflict exists when the people of Kachin State are so poor, and yet they are living in the most resource-rich area of Myanmar. Teak-covered hills, mountains of rubies and jade, and rivers where people can still pan for gold. Myanmar is the second-largest producer of opium in the world (behind Afghanistan), and the poppys are mainly grown in the Kachin and Shan states. Control of extraction and trade of these resources is a murky mix of Burmese army, KIO and Chinese interests. China is the main market and state enterprises have invested in many energy projects, the most controversial being the Myitsone Dam, the first dam on the Irrawaddy, a deal between the Burmese government and China, that disrupts the lives of many Kachins, without bringing any benefit to them. 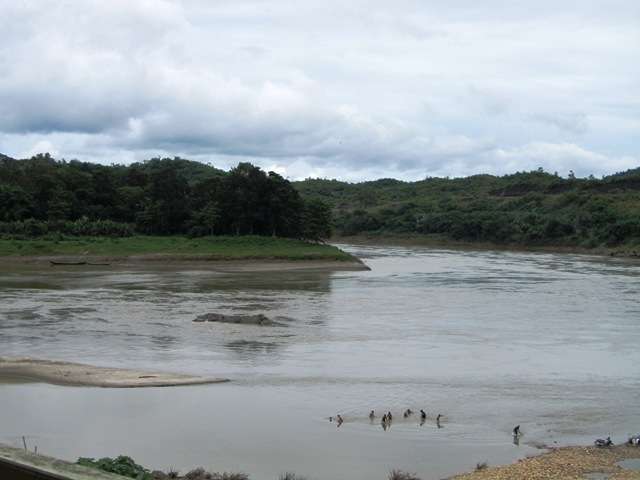 The only good roads outside Myitkyina were built by the Chinese and they lead to the dam and to China. Most make a living from farming, scavenging in the hills and mountains, working in the mines, or crossing illegally into China to work there. I saw trucks of men driving off to the mountains or China. 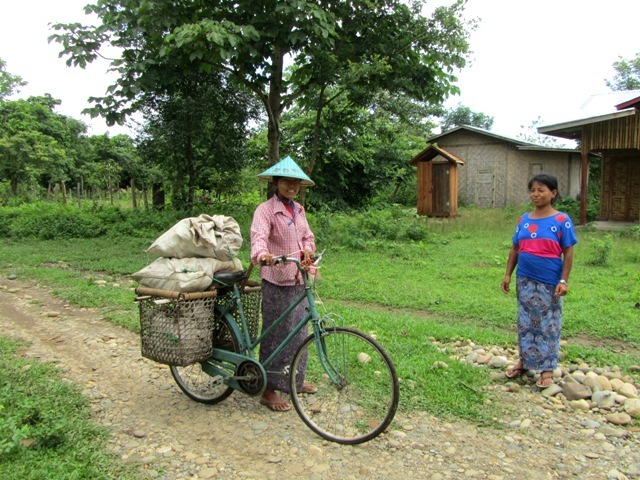 I saw women walking down the road, carrying whatever they had collected from days spent up in the hills. Foreigners aren’t allowed to visit any of the mining towns, but just hearing about them was discouraging enough. Mary knows many families whose fathers or sons go off to the mines to make some money, but then get addicted to cheap opium or heroin. Some might never come home. Some might come home only to steal from their families. Prospects are dim for the Kachin youth. Many don’t complete their education and many get addicted to drugs at a young age. Some people believe it’s a government conspiracy to prevent the young people from politicizing and joining the KIO, although I think there is no denying that some of the funding for the KIA came from drug smuggling. This is a very interesting time for Myanmar, with the army seeming to have loosened its iron grip on the nation and democratic elections to be held in November. But the army won’t be relinquishing power any time soon, with the excuse of civil conflict requiring a strong military leadership. Even if Aung San Suu Kyi’s NLD party do get into government, exactly how much they will be able to change is unknown, as the army will still keep control of the Defense, Home and Border Affairs ministries, as well as having the last say on any changes to the constitution (which happens to disqualify Aung San Suu Kyi from becoming president because of her British children). The NLD isn’t guaranteed a universal popular vote either, because of their silence on issues that affect the various ethnic minorities, so in those ethnic majority states, the voters may stick with local parties. Since the 2011 resumption of conflict, thousands of people from the hills left their homes to try to avoid getting caught up in it. 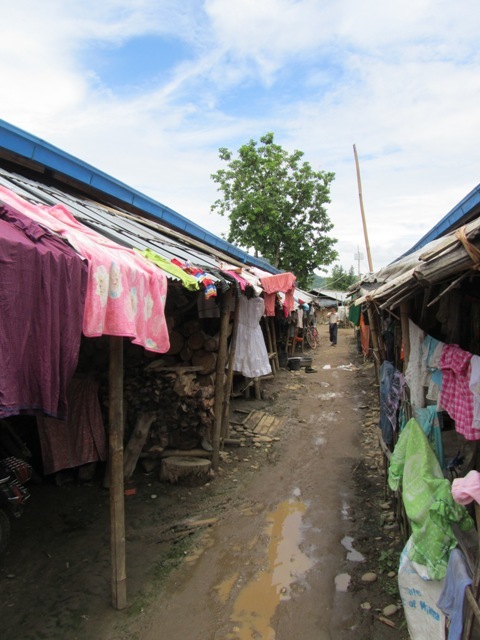 They live in refugee camps around Myitkyina provided by the UNHCR and other organisations. I visited one with Mary and a local worker as they were going to see a former patient of the Hope Centre. This one was relatively new, maybe a year old, with these people having moved from their previous camp which had burned down, accidentally or by other means, we’re not sure. 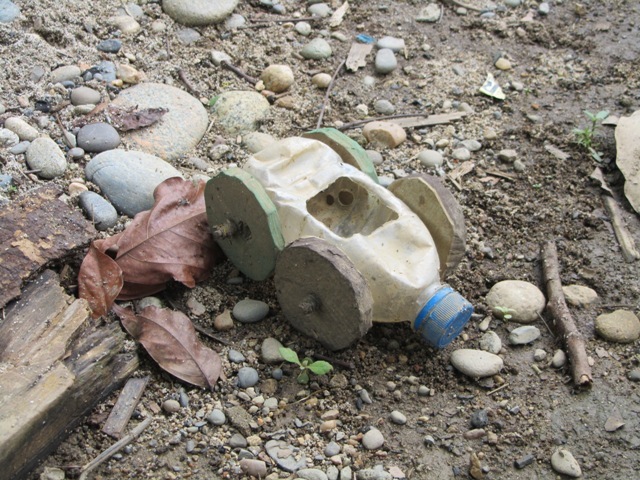 The camps were built of local materials, but very close together so there was little privacy. While we were sitting with the patient and her family, the neighbours sat across on the other side of the muddy alley and watched, because there is very little else to do. It was very sad when we were leaving, we saw a little girl sitting listlessly at the door of her house, she coughed and Mary could tell that she had TB. She spoke to the mother who told her that her other child was taking medicine for it (we could see him asleep inside), and Mary told her she had better get medicine for her daughter as well. Medicine and treatment is available, but there is a lack of information and education, and disease spreads easily in these crowded camps. Despite the sadness of the refugee camp, I have so many memories of inspiring people and places. 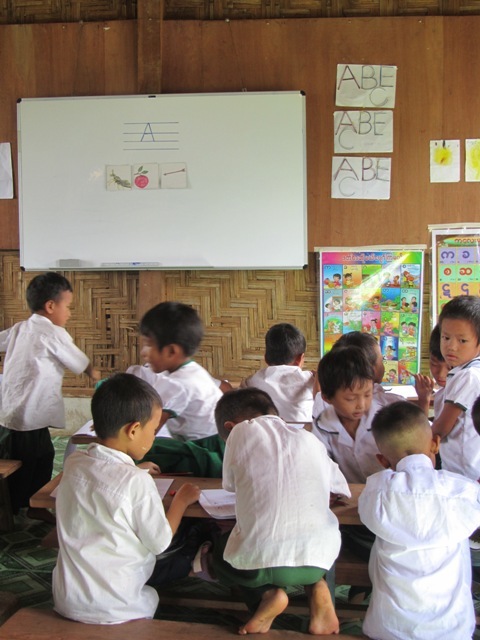 On our way to the longyi workshop, we stopped at a school where lessons were in progress. We were greeted by a Shan lady (another ethnic group) who was up in Kachin to work as a teacher trainer and she let us have a look in at the classes. 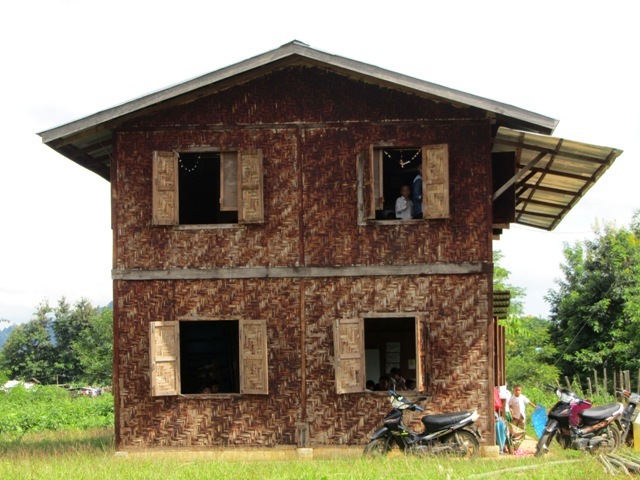 The younger students were downstairs and the older students were upstairs, and beside the school, two new buildings were being constructed of bamboo. 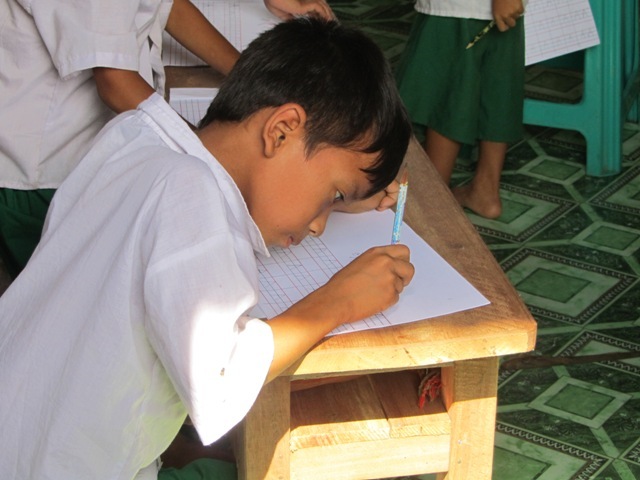 Half of the younger students were being taught about their country, both through Burmese and through the Kachin language, because some of the children wouldn’t know much Burmese. 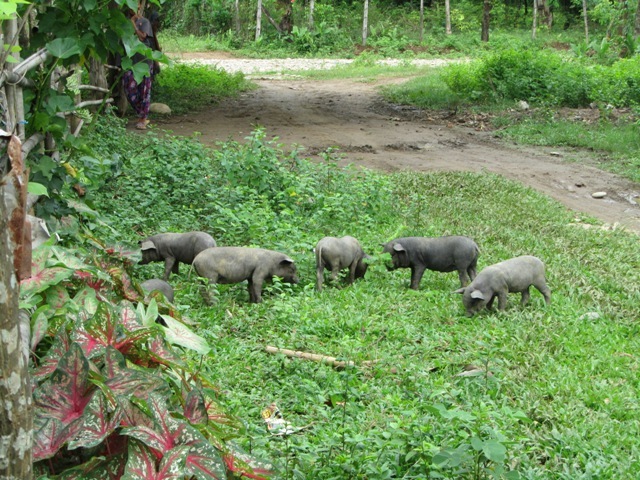 The younger of the students were practising the alphabet. I was very impressed by the students, from the way they had neatly lined up their shoes and how they continued to to focus on their lessons even with two foreign visitors there. Mary thought it was a very well-run school. 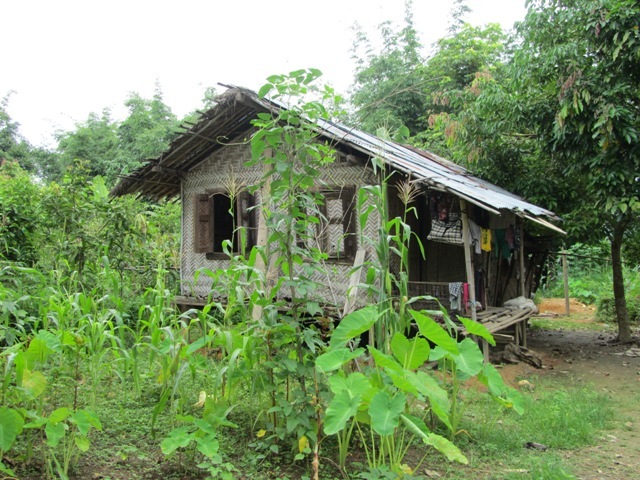 We went deeper into the countryside to visit a woman for whom Mary had been able to get funding for a new house. 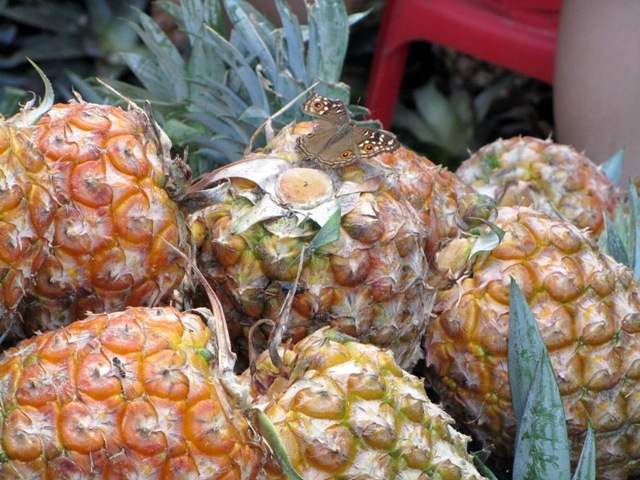 She was HIV+ and widowed with two children and her daughter had been trafficked to China. Unfortunately she wasn’t there when we called, but her son arrived home from school and was able to show us around. Things seemed to be going well for her; the new house looked good especially beside her old one that looked about ready to fall over, she had built a well, had chickens, was growing corn in her garden and had been able to see her daughter again recently. There is a notable NGO presence, and I met a Kachin man who was employed by Medecins Sans Frontieres to go out to the remote villages to check that their HIV+ patients were taking their medicine. 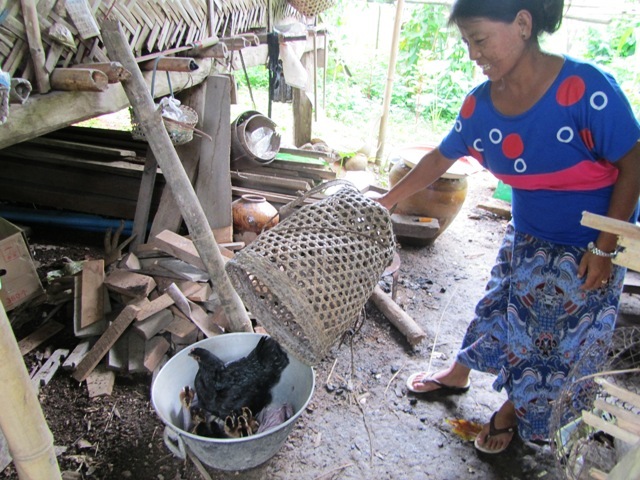 It’s so important that local people do this work, because in the remote areas, people don’t necessarily speak Burmese. At the Hope Centre one day there was a man who wanted to go back to his home in the hills, and he didn’t speak Kachin, let alone Burmese. Luckily one of the women working there spoke his particular local language. 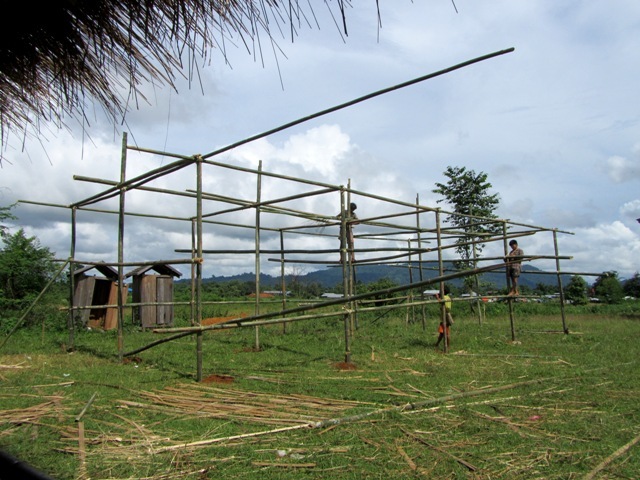 But a lot of the aid in Kachin is provided by faith-based organisations, mainly Baptist or Catholic. Every summer Mary runs a 10-day camp for HIV+ children that is mainly funded by Trócaire (an Irish Catholic charity that is most known for its Lent Trócaire box campaigns). For this camp, children are collected from their homes, no matter how remote (important for families who have no transport), and brought to the Youth Centre where they are taught about how to take care of themselves and the important of taking their antiretroviral medication. This is extremely important for them to learn at a young age because there is a problem of people only taking their medication while they are sick and then stopping when they feel better. In addition they are able to enjoy being children through sports, games and ice-cream treats. These children have hard lives and will continue to. 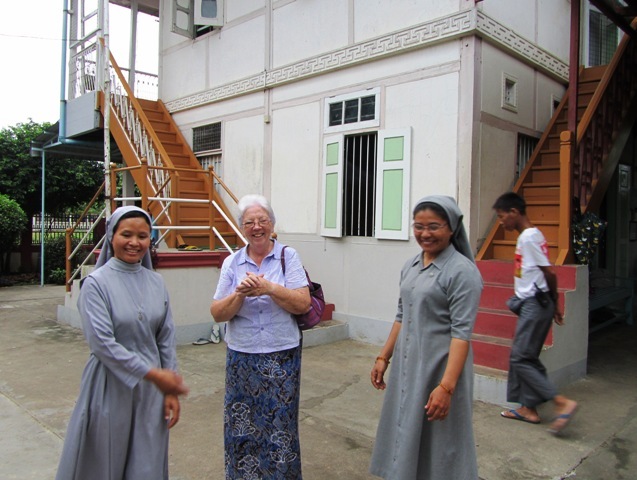 Mary Dillon is one of two Columban Sisters presently in Kachin State, where there has been a strong connection with the order since the Columban Fathers first came in the 1930s. 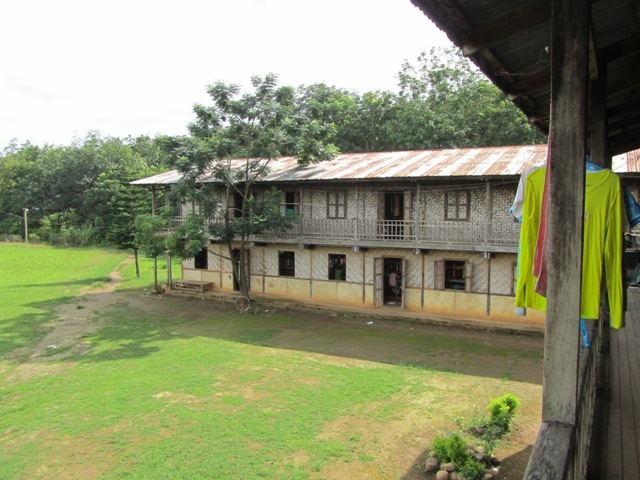 The Columban Sisters followed in the 1940s until, like other foreigners in Burma, they were thrown out of the country in 1962 and their schools and clinics were nationalised. 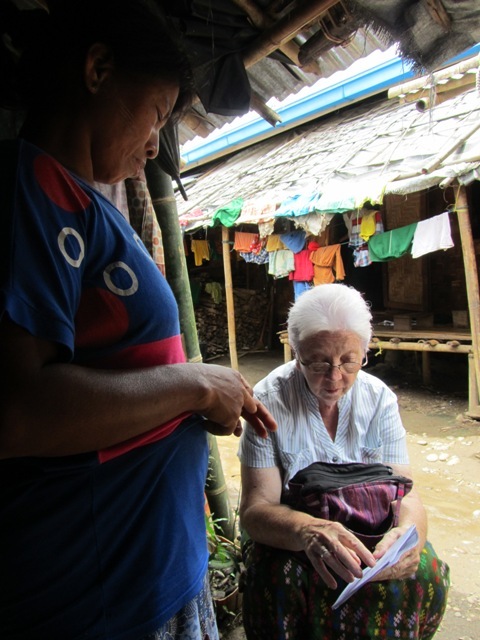 In 2003, Mary was part of the first group of Columbans to re-enter Burma, and because of the extent of HIV infection, they started a home based care program, going around to people who may have been infected, and giving them the opportunity to get tested and access to medicine and other support. In 2007 the Hope Centre was opened and has grown since then. It’s a place where people of any faith or background can come to rest and recover their health. It is linked to the Medecins Sans Frontieres clinic where people can get their antiretrovirals and medication for any other illnesses they might have as a result, and the centre provides emotional as well as physical support. Outside the centre many HIV+ people will face discrimination in their neighbourhoods because of a lack of awareness of the virus. 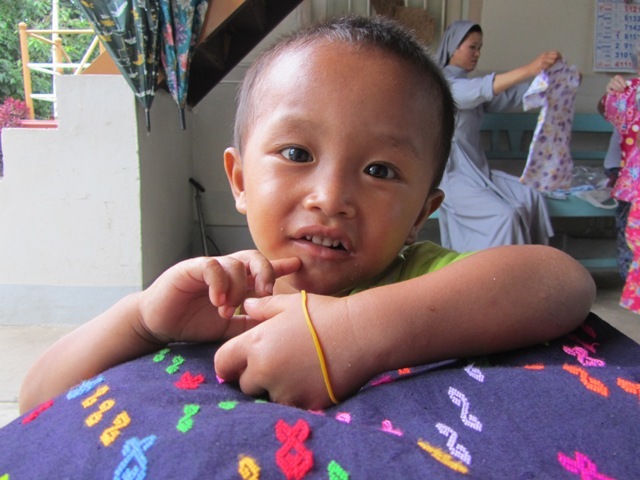 Visiting the Hope Centre was the highlight of each day in Myitkyina. 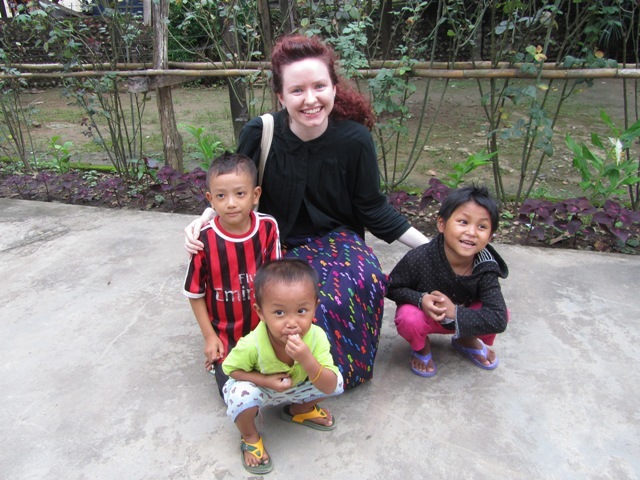 I got to chat with Kachin nuns from other orders and I got to play with the kids who were staying there at the time. I won’t forget those little messers. Despite the worsening weather towards the end of my week in Myitkyina, I was able to fly out, a day later than planned, to Mandalay, to start the next half of my trip as a real tourist. I’ll never forget my Kachin experiences and I’m in awe of the people working to improve the health, education and prospects for people in the area, as well as of the locals themselves who live their lives in such hard conditions. I’m so grateful to Mary for sharing this with me. Do check out the articles that are linked in this and the previous post if you would like to learn more about the political situation in Myanmar, civil conflict and the plight of the Kachins. I spent two weeks in Myanmar in July, following a couple of months of research and getting vaccinated in Japan. Armed with a backpack of necessities for the monsoon season and my eVisa, I took a direct flight from Tokyo to Yangon, the largest city in Myanmar, located near the Irrawaddy delta. 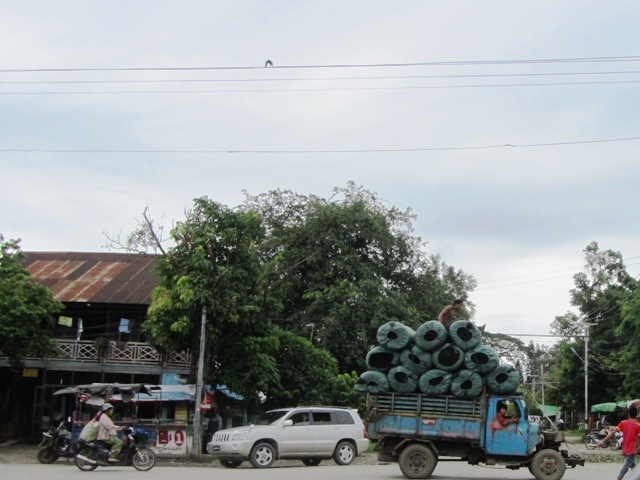 I only had a brief glimpse of the city with its street food tents and mobile phone shops, before flying the next morning to Myitkyina in the north of the country. 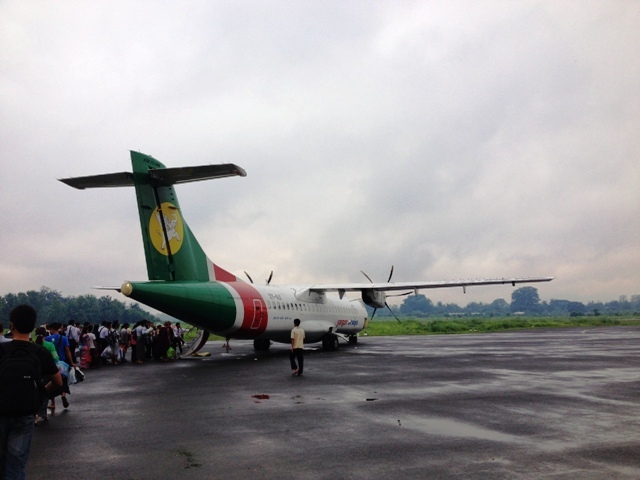 I had left Burma and arrived in the Kachin State. A note about the name of the country: both of the English terms Burma and Myanmar come from the Burmese language. When the government changed the name from the Union of Burma to the Union of Myanmar in 1989, many people didn’t recognize the legitimacy of the government to do so, and continued to refer to it as Burma. While I was in the country I noticed most people called it Myanmar, and that coupled with the fact that not everyone in the country is or speaks Burmese, gave me the impression that the name Myanmar is more inclusive of all the ethnic minorities as well as the Burmese majority. I may use Myanmar to refer to the entire country and I may use Burma when I refer to areas where Burmese culture is the strongest. The Kachin people are a minority ethnic group in Myanmar, although they make up the majority in Kachin State, mainly in the rural areas. Compared to Japan, where the population is very homogeneous, individual and group differences were much more noticeable. It was easy to spot people who were of Indian, Nepalese or Chinese descent, but even though I couldn’t tell who was from what group in Myanmar, it was really interesting to see all these strong ethnic identities in such a rural place. 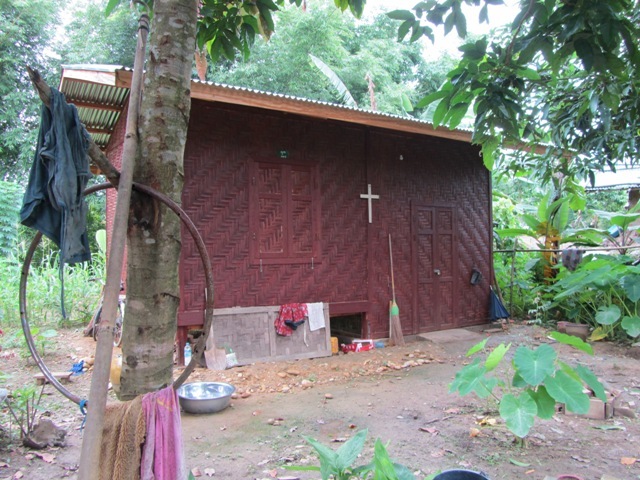 In Myitkyina I saw a Hindu temple, a mosque and a Buddhist temple, but Kachins are mainly Christian, so there were far more churches than pagodas. I attended a Kachin Mass, given through the Kachin language, alongside ladies with beautiful lace veils and statues of Jesus and Mary illuminated by LED halos. 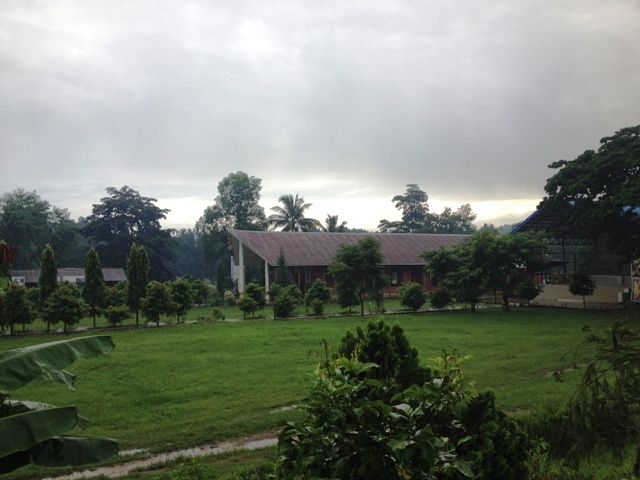 Every morning I would wake up to the sound of Kachin hymns sung by the neighbouring catechists-in-training. 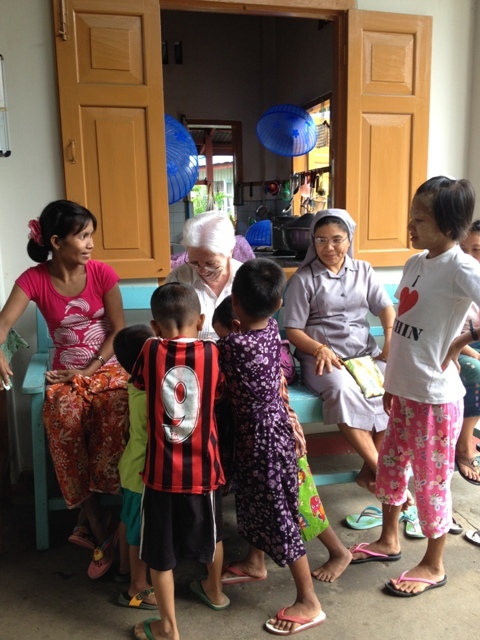 I was visiting my relative, Sr Mary Dillon, a Columban nun who has been working in Myitkyina since 2002. I stayed with her for a week, seeing and experiencing places and ways of life far from what I’ve known. I’ll write two posts about my time in the north, first about the Kachin culture and second about the difficulties that are faced there. 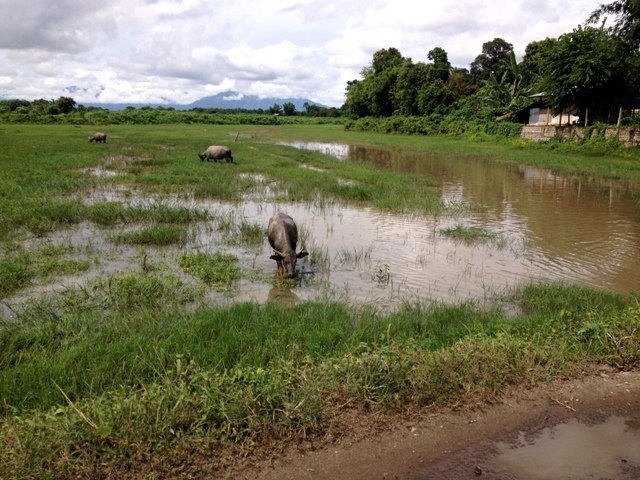 For most of my week in Myitkyina we had typical rainy season weather, it rained heavily in the morning and sometimes in the afternoon, but we did have some sunny spells. It was a lot cooler and less humid than Japan, which surprised me. 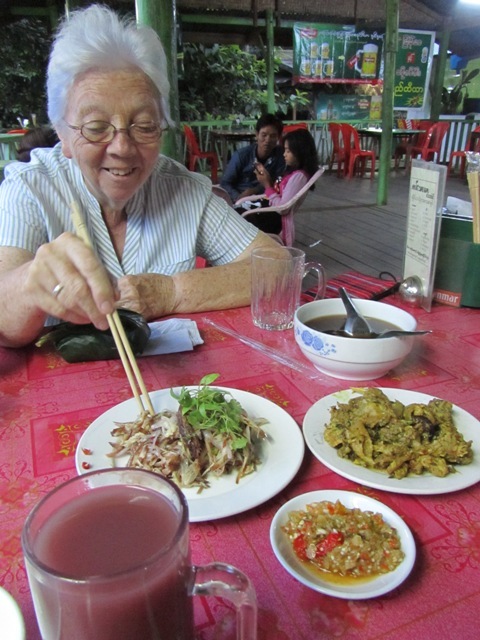 Sr Mary has a real affinity for the Kachin people and culture, and she took me to some famous sights and local places. 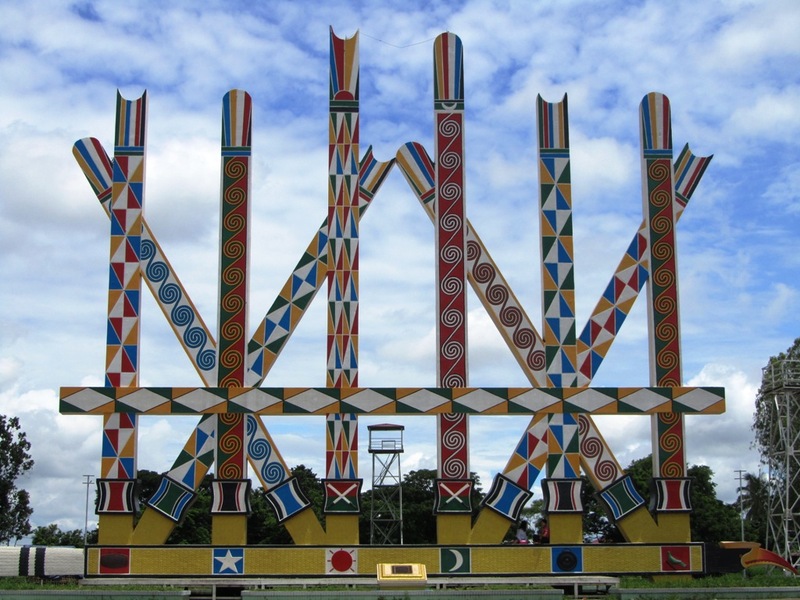 We visited the Manau poles in Myitkyina where the Manau dance festival to celebrate Kachin State Day is held on January 11. Participants dressed in traditional Kachin costumes dance around the poles to a drum beat. The festival was held annually from 1994 – 2011 during the ceasefire between the Burmese army and the KIA (Kachin Independence Army). This year it was held again to some controversy because of the ongoing conflict between the two armies and the displacement of many Kachin people from their homes into refugee camps since 2011. This dance is part of the animist tradition of the Kachins, but all over Myanmar you can find animism living alongside other religions, such as in nat (spirit) houses. 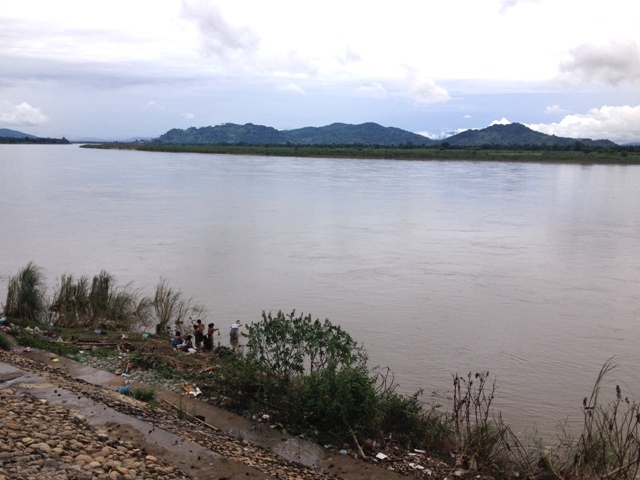 One day we went north of Myitkyina to visit the confluence of the N’mai and Mali rivers which forms the Irrawaddy river that runs from north to south in the country. It’s an important, if not very beautiful, spot, and although it was the low season, we saw quite a few other local sightseers. 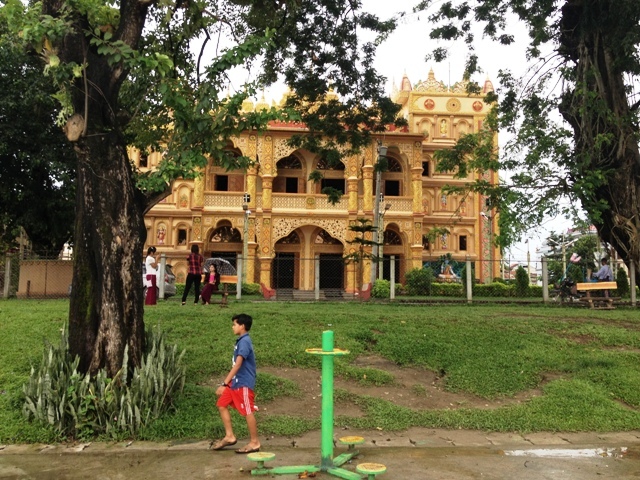 The nat house and pagoda above are dedicated to it, and there is a plaque explaining its importance for the Kachin people. Nowhere is safe or sacred from controversy however, as at a site near the confluence, construction on a Chinese-funded dam has been halted since 2011. 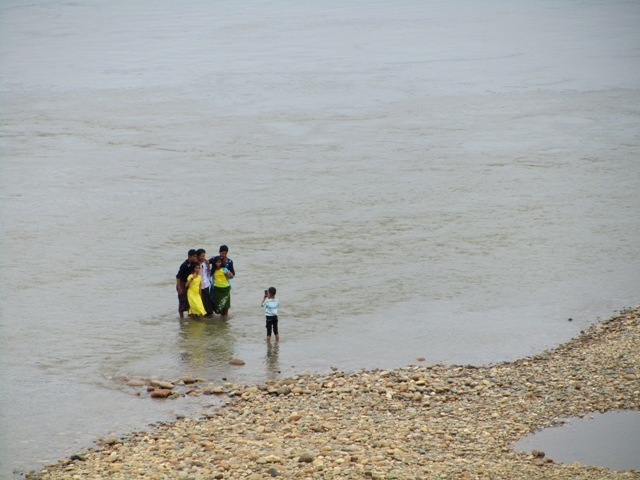 Communities of local farmers and fishermen have already been relocated from their villages to prepare for the flooding the dam will cause, just so the government of a country with regular power-cuts can export energy to China in return for political support. I went along with Mary on her errands and I loved traffic watching. Fortunately Mary was a slow and safe driver because many of the other drivers weren’t. Most of the traffic was made up of trucks of various motors and sizes, and motorbikes. It was common to see passengers hanging off the back of full trucks or a five-person family on a motorcycle. 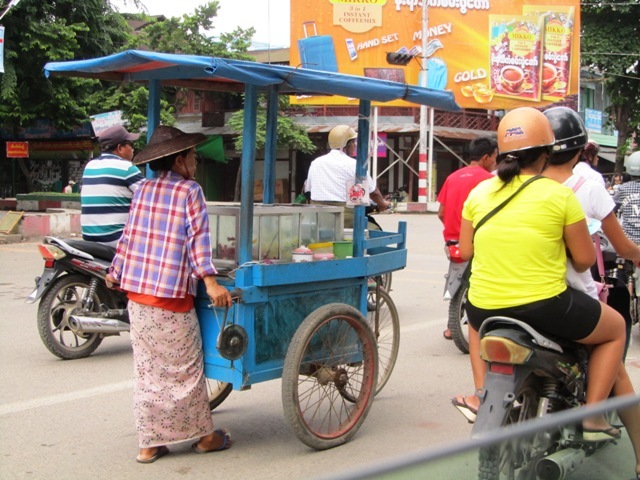 I saw many young couples on the road, with the girl elegantly perched side-saddle on the back of the motorbike. In the picture below, the guy in the middle was serenading his friends on the guitar. And in the photo underneath, you can see a typical petrol station – a little wooden table with petrol decanted into empty whisky bottles. 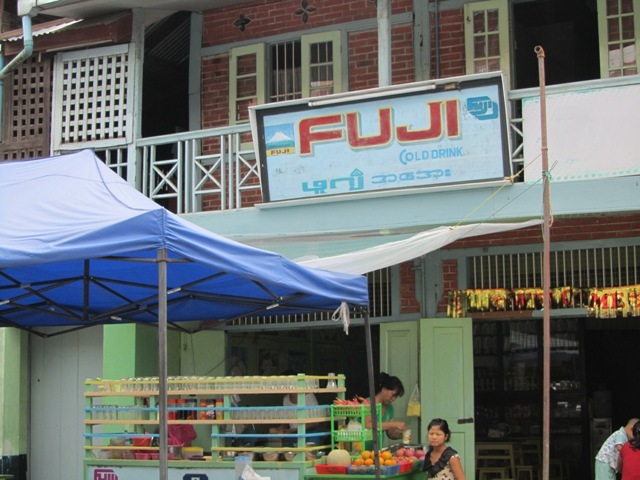 I was very glad to have someone to show me around in terms of eating and drinking, and my first refreshment stop in Myitkyina was ‘Fuji’, a juice-shop/restaurant run by Chinese protestants, which was to become a regular pit-stop during my stay. I loved the yoghurt drink so much that once I drank two in one sitting. 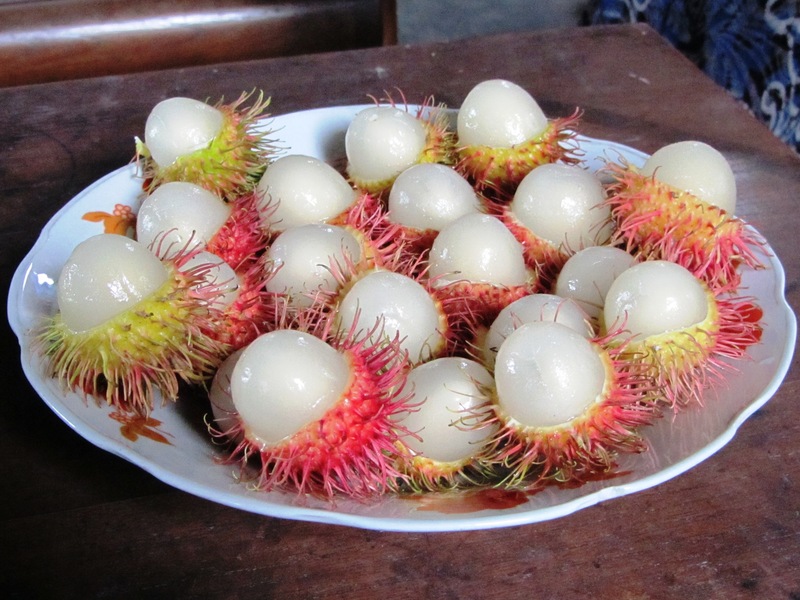 I savoured the deliciously cheap fruit (coming from Japan where it’s so expensive), and I tried rambutan for the first time. 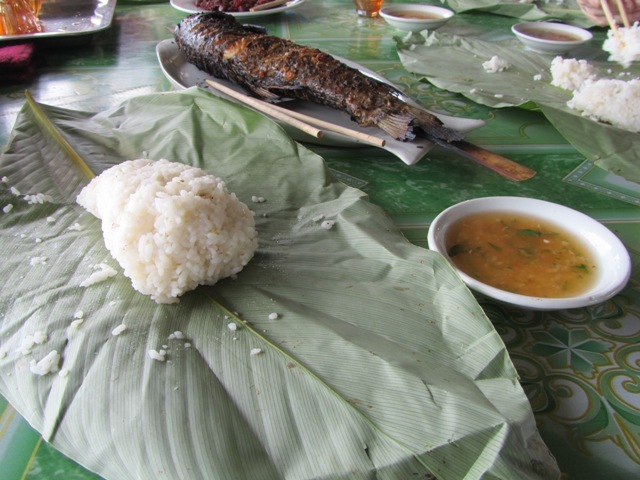 I was very happy to have people to order for me and just enjoy what showed up at the table – rice wrapped in banana leaves, grilled whole fish, spicy salads, and Kachin rice wine (nothing like Japanese sake). I was fascinated by the style and fashion in Myanmar. Of course people wore western clothes too, but I was surprised that the majority of people I saw wore longyi, a cylindrical sarong that men wear tied at the front in a knot and women wear wrapped around to the side. 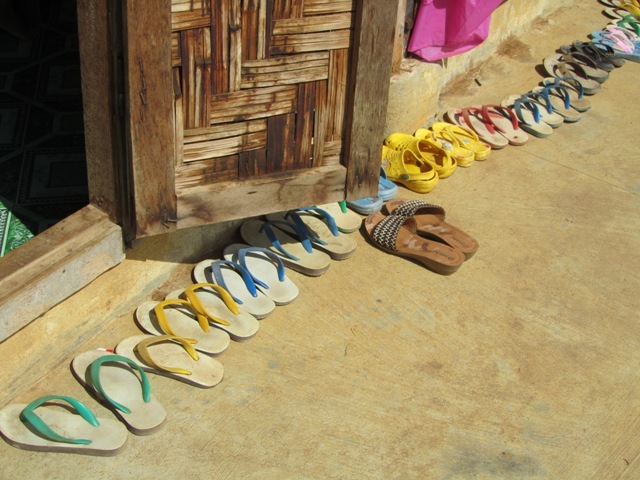 Different ethnic groups have different patterns or variants in how it’s worn. A typical outfit for a Burmese man would be a chequered longyi in a dark colour, worn with a collarless white shirt. For a Burmese woman, you can see longyis being paired with a separate blouse, or a tailored outfit of a longyi and matching top, usually fastened to the side, Chinese-style. Plus the obligatory flip-flops. Pictured above is the traditional make-up called thanaka, made from ground bark, which is applied to the face as a yellow paste. As well as being a cosmetic, it is supposed to act as a sunblock. 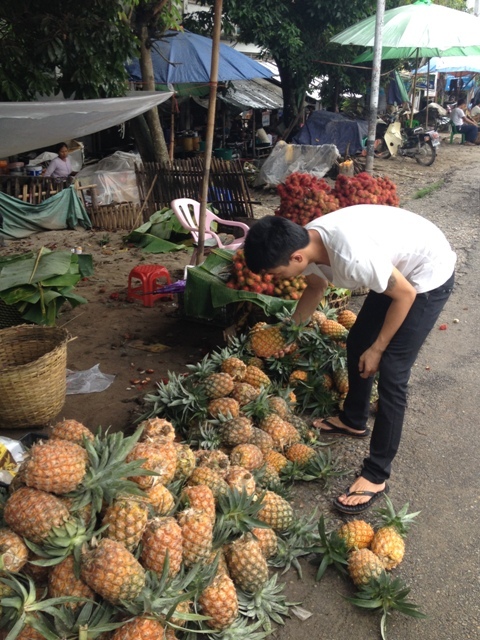 Mary had taken me to the market to look at the longyis and Kachin goods. 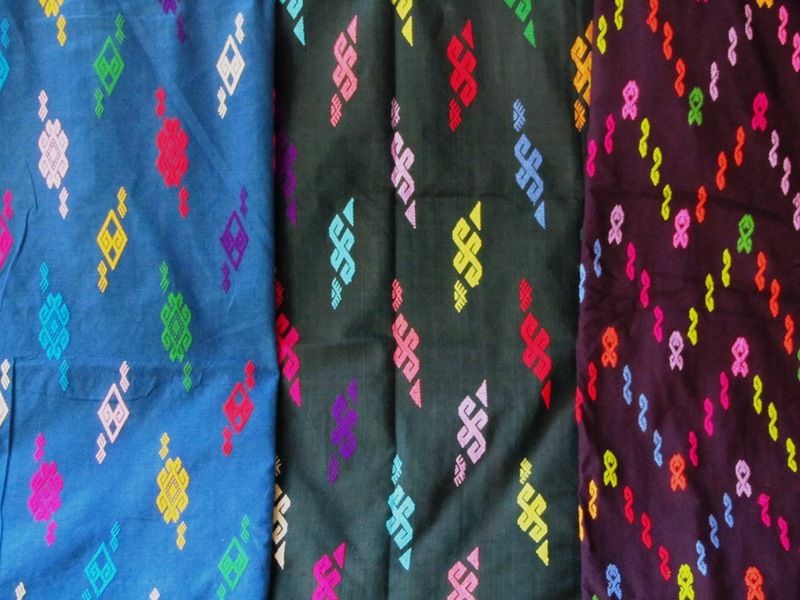 I really like the Kachin designs, they are so colourful and striking, they remind me of Aztec patterns. I bought a purple longyi as a rectangular piece of material, and we brought it to a seamstress to be sewn into a tube and have a black waistband attached. Another day we went out to a centre for local youth where a fellow sister of Mary’s was working. 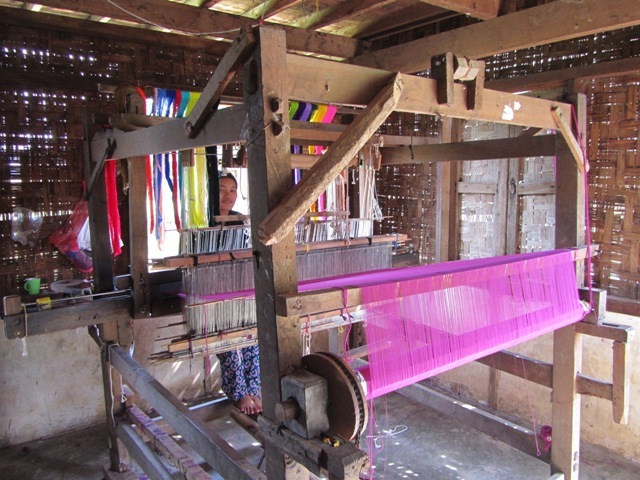 Beside the centre was a workshop where longyi with Kachin designs were being woven. 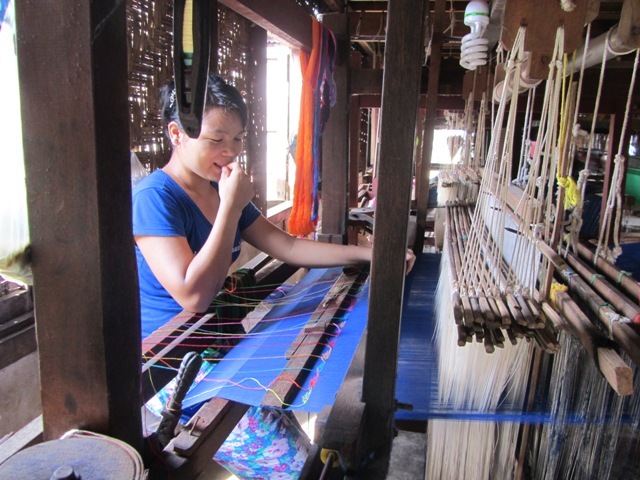 I was amazed when I saw how they were decorated because although the design looked embroidered, it’s actually woven in as the longyi is being made. Over the workshop there was a storehouse with finished longyi. I couldn’t help myself and bought two more because what better souvenir than these beautiful textiles from a local business. Just like Sr Mary, I have a big appreciation for the Kachin now.